This week the administration reported that as of February, 4.2 million Americans signed up for a health plan through their state's Health Insurance Marketplace. As open enrollment comes to a close, what does that mean for total enrollment numbers? 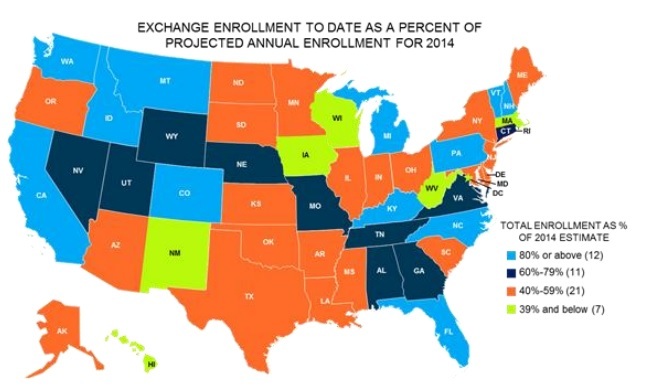 And, how do enrollment numbers compare state by state? A recent analysis by Avalere finds that national Health Insurance Marketplace enrollment is on track to reach 5.4 million by the end of open enrollment on March 31, with an estimated 1.2 million people enrolling in March. That number falls short of the revised Congressional Budget Office (CBO) estimate that 6 million people would enroll in the Marketplaces in 2013-2014. Avalere's analysis takes a look at the enrollment figures by state. Marketplace enrollment numbers vary greatly by the type of exchange the state is using (state-run or federally-run). In the beginning months of the Marketplaces, enrollment via the state-based Marketplaces was out-pacing enrollment via the federally-run Marketplace (healthcare.gov). However, now that healthcare.gov's website has been fixed, enrollment via the federally-run Marketplace is catching up, and in some states surpassing, state-run Marketplaces. Where does your state Marketplace enrollment stand?